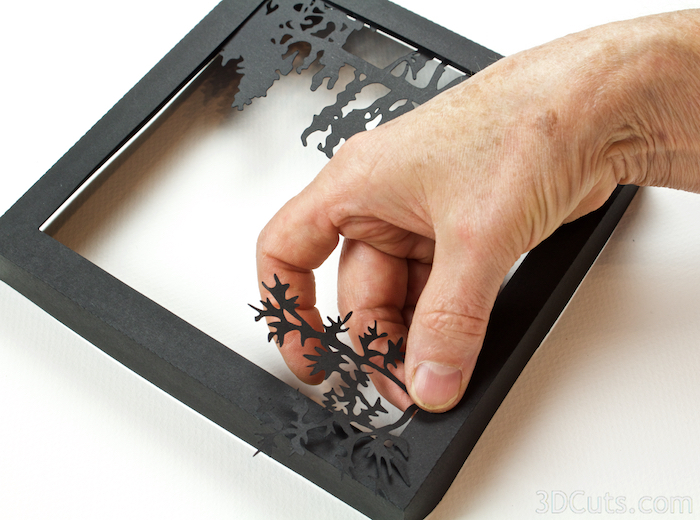 This tutorial is for the Summer Scenes 4 layer shadow box designed by 3Dcuts.com. The process is similar for many of the 4 layer shadow boxes I have designed. The download file direct from 3DCuts.com comes with 7 different sporting characters that can be inserted into the peaceful lake scene. (The SIL Store download only has 1 but the others are available here.) The impact can be dramatically changed by using different background papers. Five are included with the 3dcuts download. The Silhouette download doesn't include the backgrounds but they are available here. The assembly is easy and basic 3d construction. The cutting of some of the the file is more advanced and requires some skill with detail cutting. Hints are included. 8.5 x 11" card stock - I used the 65lb Cardstock from Recollections. Each shadow box takes 4 sheets of black plus 1 sheet for the sky. Adhesive - I use Scor-Tape, Aileen's Tacky Glue, and glue dots although other adhesives would work. 1. Download the cutting files for your cutting machine from the 3dcuts.com store . For the Silhouette: The SVG files from this site will need to be turned into cutting files. Click here for detailed steps on how to use SVG files on your Silhouette. http://www.3dcuts.com/tutorial-upload-svg-silhouette. You do need Designer Edition to access the svg. The free version of Silhouette can access dxf but file attributes like sizing and dash characteristics will be lost. You will need to adjust. I recommend getting the Designer Edition and do not supply technical support for dxf importing.. It depends on the specific file you are cutting but most will have 4 box layers, 1 back ground piece and an optional hanger. Some designs might have accessories that get added as embellishments. Several of these cutting files have very fine lines. When cutting fine lines I find it best to have a good blade, and a good mat. I switched to the Silhouette Premium blade and had no trouble cutting the fine lines of this design. I also save mats at the perfect stickiness for fine cutting. A slightly seasoned mat will be too sticky and an over-used mat isn't sticky enough. On the most detailed pieces like the characters I used the double cut feature. Also when removing the frames from the mat, always turn it paper side down and curl the mat off the paper. Use a spatula to carefully separate the two. Fine lines can tear if you remove it without care. Place the 1 in the upper left corner and fold on all dotted fold lines. You will fold the edges AWAY from you on frame 1. Frame 1 is the outside frame and these corners are visible when the project is complete. I use 2 strips of Scor-tape in each corner and then fold the tab to the inside and adhere. Add Embellishments to Frame 1. The pine tree gets added to the back side of the right edge. Apply 6 foam pop dots to the FRONT of the pine tree. Attach it to the back side of the right edge of the frame BUT leave a space between the edge of the tree and the side and bottom walls of about 1/16". The other shadow box walls will slide into this space and you do not want to block them. If any of the pop dots are visible from the front, take a sharpie marker and blacken them so they won't stand out. The other embellishments (branches) will get added later so you can place them with other landscape parts in view. Fold all edges along the dotted fold lines toward the BACK on frame 2. This frame is an internal frame and it gets held together with the other frames. I just used 1 glue dot in each corner to adhere the corners. Frame 2 is now complete. Place that to the side and move onto frame 3. Fold all the edges toward the BACK on Frame 3 and use glue dots to secure the corners. There are no embellishments to add to Frame 3. Frame 4 has all edges folded TOWARD you. Use adhesive to glue the corners keeping them nice and square. Time to choose a background for your shadow box. 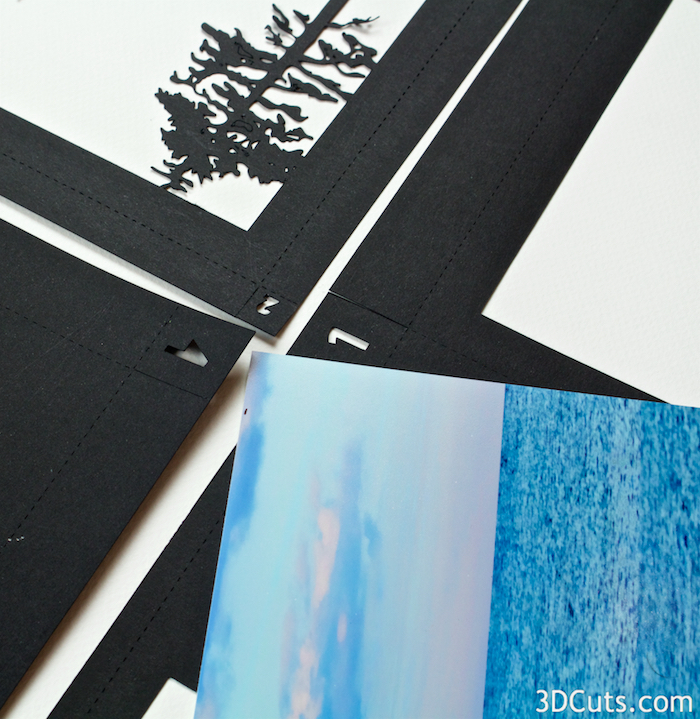 Included with your 3dcuts download are 5 photo backgrounds. You can choose any of these or make your own. Print the background using a color printer. I used photo paper to get the brilliant colors. If you downloaded this file from the Silhouette online store, it came with no backgrounds and you need to either create your own or you can purchase just the backgrounds here. There are many to choose from. If you dont have this download you can print a copyright free photo from the internet or create one using water color washes. Even a simple gradated piece of paper will look stunning. It needs to be 6 3/8" square. Ideally the horizon line should be about 2 5/8" down from the top edge. Choose your background and cut it to 6 3/8" square making sure the horizon line is 2 3/8" down from the top..
For this shadow box the background is split in two and applied to two different levels. The top portion is 6 3/8" w X 2 5/8 h.
Adhere this sky potion to the inside of frame 4 aligning it with the top of the box. The bottom portion of the background gets adhered to the back of frame 3. The bottom potion is 6 3/8" w x about 3 7/5" h.
Apply Scor-Tape to the edges of the back side of frame 3 as shown below in the left image. Peel the backing and adhere the background bottom portion. Make sure it doesn't peek above the landscape. Place a glue dot behind the point of land on the right side as well and glue that to the background. Apply adhesive to the back side of the sportsperson silhouette and adhere this to the background. Choose any of the 7 designs and place them between the trees in the location that works best for you. Try to not have heads behind branches. Glue frames 2 and 3 into frame 4. Leaving the backing in place. Using tweezers, reach into the seam and grab the backing off the score-tape. Adhere embellishments to Frame 1. Add the smaller branch in the lower right again starting behind the bottom frame but coming out in front of the side edge. 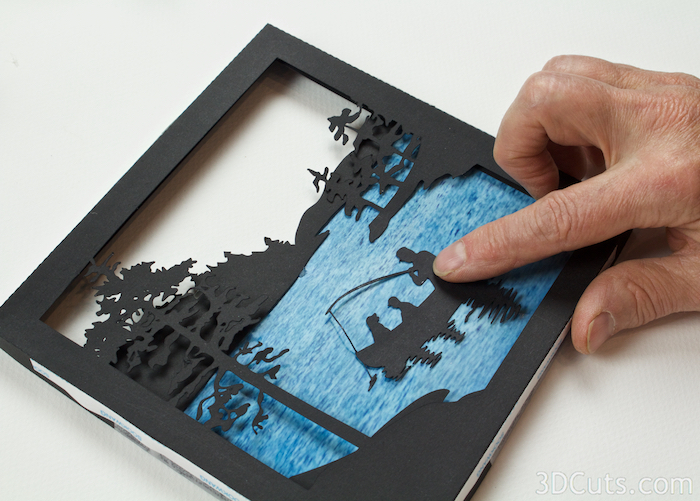 Note: I design a series of water scene shadow boxes available through 3dcuts.com. There are a variety of add-ons including cattails and grasses. You can create your own foreground scenes mixing and matching these various parts from the different shadow boxes. Sizing is similar on all. Place on the back edge and near the center as shown in the left photo. Congratulations! Your Summer Scene Shadow Box is complete. Where will you display it? And which Nature themed shadow box will you make next?